Tournament MVP Caleigh Cortez takes her turn snipping a piece of net after Weaver won its area tournament Friday. WEAVER – Weaver coach Gary Atchley was talking to Brad Hood before the game and playfully told his Pleasant Valley counterpart to not even think about cutting down the nets in his house if his team was fortunate enough to win. You could bet the house, though, the Lady Bearcats would be doing it if they did. Weaver won the area title last year but didn’t get to punctuate it by cutting down any nets because they did it in somebody else’s gym. It didn’t take them long to bring out the ladder and scissors Friday after beating the Lady Raiders 50-39 for their 20th win of the season and the Class 3A Area 11 title. “That’s the first time I’ve ever cut a net down; that means a lot to us,” Atchley said. “I told them a 20-win season, back-to-back area championships, we’re going to cut these dad-gum nets down. 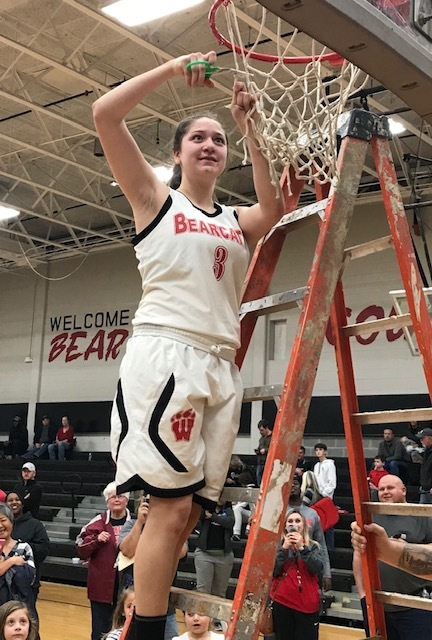 Now the Lady Bearcats will host Area 15 runner-up Sylvania (15-11) in the sub-regional round Monday at 7 p.m. with an eye towards securing the program’s first trip to the regionals since 2004. PV, meanwhile, will travel to defending state champion Pisgah (29-1), the once-beaten juggernaut both teams here wanted to avoid at all costs. Weaver trailed only briefly early in the game. The Lady Bearcats took control in the second quarter under a hail of 3-pointers and maintained it by hitting their free throws in the second half. The Lady Bearcats were 14-of-20 from the line in the second half, 8-of-12 in the fourth quarter. Abby Gaines made seven in a row at one point and, in just her second game back from a high ankle sprain, wound up being Weaver’s leading scorer with 15 points. There was a tense moment midway through the third quarter when Hood was hit with a technical foul. He was seated on the floor in line with the bench – a position that seemed to relax both him and his players – when he was told by an official he either had to stand or take a physical seat while coaching. Hood said there wasn’t much he could do except scratch the officials from future PV games, but he did plan to contact the state association about it. As for any impact on future action regarding the game, Hood doubted anything more would come from it. It had little to do with the outcome other than add two points to the Lady Bearcats’ total. Weaver did extend its lead to 13 a few minutes later, but that could have happened anyway given the state of the Lady Raiders’ play. When it finally was over, it was time to celebrate. One-by-one the Weaver players made their way up the ladder to snip their own personal piece of history they couldn’t get a year ago. PLEASANT VALLEY – Lindsey Pritchett 1 0-0 3, Rylee Haynes 1 1-2 4, Chandler Dorsett 1 2-2 5, Emma Hood 5 1-5 11, Karmyn Sparks 3 3-7 9, Brooke Perry 3 0-3 7. Totals 14 7-19 39. WEAVER – Caleigh Cortez 4 3-7 11, Kiese Hubbard 1 0-0 2, Maleah Foster 3 0-3 7, Trinity Pulliam 2 0-0 4, Abby Gaines 3 8-10 15, Amira Carter 1 3-4 5, Haley Homesley 2 0-0 6. Totals 16 14-24 50. 3-point goals: Pleasant Valley 4 (Pritchett, Haynes, Dorsett, Perry); Weaver 4 (Foster, Gaines, Homesley 2). Technical fouls: PV coach Hood. Fouled out: Foster. Total fouls: Pleasant Valley 16, Weaver 18. Officials: Hall, Stone, Morehouse. CENTRE – Cherokee County outscored Jacksonville 18-2 in the second quarter and with the second half being even it made all the difference in the Lady Warriors winning the Class 4A Area 10 championship game, 45-31. The Lady Warriors will now host Talladega in Monday’s subregion round, while Jacksonville will travel to Anniston. Jordyn Starr and Laney Johnson led Cherokee County with 17 and 14 points, respectively. Kayla Broom led Jacksonville with 13 points and 10 rebounds. Jacksonville was really impacted by a 1-for-22 showing from 3-point range. Rebekah Gannaway had its only 3-pointer. JACKSONVILLE – Kayla Broom 5-12 3-6 13, Rebekah Gannaway 3-4 0-0 7, Patience Carr 2-16 3-4 7, Amia Montgomery 1-4 0-0 2, TiAsia Williams 1-4 0-0 2, Brenna Stone 0-4 0-0 0, Amarie Curry 0-1 0-0 0, Malijah Goggins 0-3 0-0 0, Aly Meagher 0-0 0-0 0. Totals 12-48 6-10 31. CHEROKEE COUNTY – Jordyn Starr 7-21 1-1 17, Laney Johnson 4-14 4-4 13, Crimson Mahannah 3-13 1-2 8, Kayleigh Hunter 2-3 1-2 5, Karlee Perry 1-2 0-0 2, Aubrie Williams 0-0 0-0 0, Belle Mahannah 0-2 0-0 0. Totals 17-55 7-9 45. 3-point goals: Jacksonville 1-22 (Broom 0-4, Gannaway 1-2, Carr 0-10, Williams 0-3, Goggins 0-3); Cherokee County 4-20 (Starr 2-7, Johnson 1-6, C. Mahannah 1-6, Perry 0-1). Rebounds: Jacksonville 36 (Broom 10, Stone 8); Cherokee County 36 (Johnson 8, C. Mahannah 8). Total fouls: Jacksonville 9, Cherokee County 8.